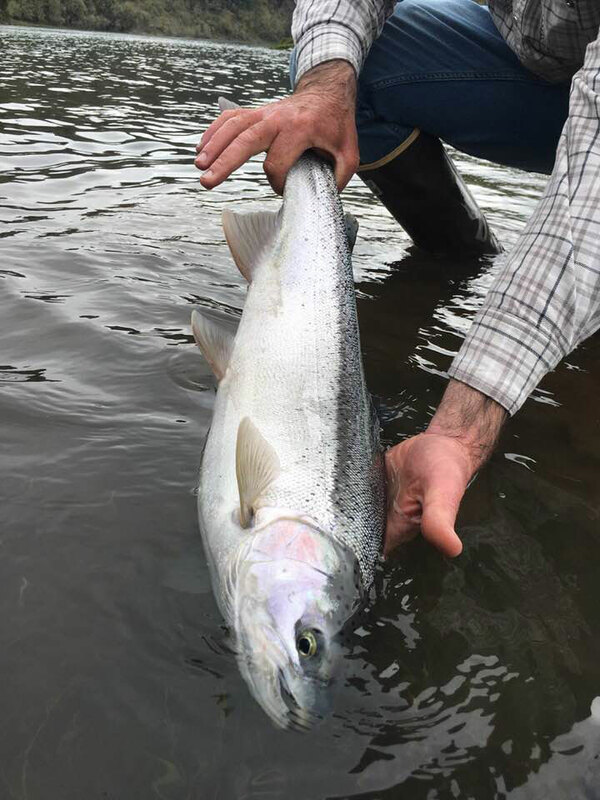 Most of us have a “bucket list” of fishing destinations; Bone Fish Christmas Island, German Browns in Argentina, Taimnen in Mongolia, or maybe something closer to home, say, Madison Valley in Montana or one the many great rivers in Alaska. 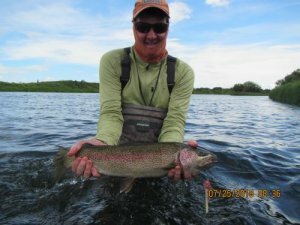 Well, this past July, fellow Flyfishers’ Club member Bruce Oldenburg and I had an opportunity hit one of our “bucket list” destinations – Eastern Russia on the Kamchatka peninsula. Our destination was the Ozernaya River (Oz for short) on the sparsely populated northern part of the peninsula. To get there is an adventure in itself. After an overnight in Anchorage, it’s a 4-hour flight to Petropavlovsk, Russia where our Russian lodge outfitter, Victor, met us and transferred to a private coach driving 4 hours north to the helicopter port. The helicopter ride took another two and half hours after refueling but we arrived, ready to fish. After up packing and camp introductions, we were off the river for a few hours of fishing, despite the long travel day. The Ozernaya River is one of the world’s last unspoiled, untouched rivers, full of huge leopard trout, Dolly Varden, grayling and all 5 species of salmon. I suspect it’s what Alaska was 150 years ago. Less than 75 people fish the OZ in a given year, so fish are not easily spooked and are eager to eat. With the jetboats on hand, we had 25+ river miles of gin clear water that was easy to wade. 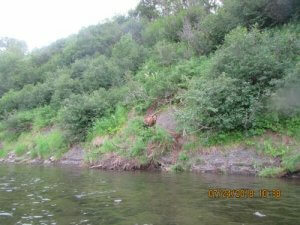 Bruce and I went the 3rd week of July, the 2nd group to fish the river this year. Fish were chunky and showed no sign of changing their eating habits. 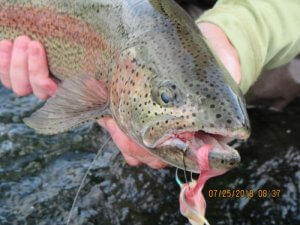 A typical day would be to 15-20 rainbows averaging 20 inches (My personal best was just shy of 26 inches.). Grayling and dollies would have similar catch days and occasionally hooking a chum. What makes the river even more intriguing is the fly patterns. Top water flies consisted of mouse patterns (think Moorish Mouse and Mr. Hankey) all of which trout, grayling and dollies eat. More surprising was the dry fly show in the late afternoon using simple caddis patterns. Sub-surface it was BIG streamer and leech patterns. Fish are not leader shy at just six feet using 15lb test for streamers, 2X for dry flies. Camp accommodations were simple yet comfortable. Hot showers and flush toilets, (yes, flush at a remote river camp. Go figure!) Food was excellent, with hot cooked meals at breakfast and dinner. One never walked away hungry or without a few shots of local Russian Vodka. I even had the good fortune of having lunch cooked stream side by my guide. I will say that the areas mosquitoes were thick morning, noon and night. Over the years, I have had my share of remote fishing experiences. Hands down, I have never experienced so many mosquitoes as I did on the OZ. Little wind and no rain made the situation worse, but I am told that the mosquitoes nearly disappear later in the season. I would be remiss if I did not mention the area’s brown bear population. Although it’s been nearly 10 years since the last Russian aerial census, the population estimates for the entire Kamchatka peninsula range from 10,000-14,000 bears in an area about the size of California. Over the course of week, we saw between 30 and 40 brown bears. Generally speaking, the bears were not the least bit interested in people as they actively patrolled the rivers looking for salmon. In camp, there were 3 Laika “bear dogs” who spent the days resting and nights patrolling camp to keep the bears away. Personally, I never felt threatened by bears but always took precautions to ensure I did not put myself in harms way. If you want to learn more about Kamchatka, feel free to contact me at kennetab@gmail.com or 971 998-6783.